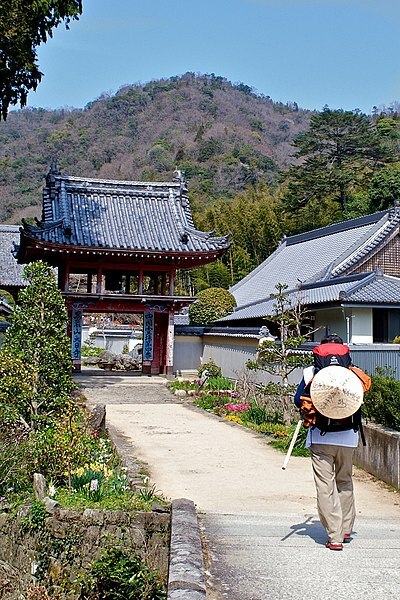 While doing this virtual pilgrimage to discover the roots of Buddhism and the influence on haiku, our host and guide, Chevrefeuille, mentions we will skip a few of the 88 temples on the Island of Shikoku. Today, however, we travel off the main road and walk a bit into a mountain valley to find the Dainichi-ji Temple. Although the original temple no longer stands due to repeated destruction forces – you know how that always happens – Matsu, a 17th century monk, reconstructed the temple. The temple honors Vairocana Buddha or the Buddha of Emptiness. A temple to emptiness that is no longer there – this is perfection. thanks for this lovely comment, EAM. The way of the pilgrim? yes, the challenges that crop up as we journey through life…thanks for the cheery note, Jules. some things never change…thanks for hopping in a wonderful comment, Milu! That is a sad and powerful haiku to cap it off. Well done! thanks for the wonderful comment, Celestine. happy Friday!! A lovely pilgrimage you are taking us on (with the guidance of Chevrefeuille). And I love the down to earth feeling the haiku emits. indeed, it’s a wonderful virtual pilgrimage…thanks for the lovely comment, Otto.